Diane and I are getting back into our groove of running - with the hot hot weather, it's been extra challenging, but we're getting out there and doing it, so I am awarding us a gold star. Of course, we can't go long without having an adventure, and our run on Sunday was one to remember. We were trucking along, just the two of us, when right around the 2.5 mile mark, Diane grabbed my arm and said WHAT IS THAT?? I was still running when I looked ahead to see an armadillo crossing our path - and yes, I screamed! It startled me! Plus I had that forward momentum thing going, and had Diane not noticed it, we surely would have run into it, eek! Diane ended up yelling at it to go away, and it did, back into the field from where it must live. I, in the meantime, tried to recover from my extra bout of cardio brought on by being startled plus screaming about it - sheesh! I do not need that much excitement in my life. Afterward, we went to Blue Baker, where our baker asked us why we weren't there on Saturday - he'd left a loaf of ciabatta bread for us! He understood when we told him about the baby shower, but we were all sad to have missed out on the ciabatta. I mean sure, we could have bought a loaf of day-old ciabatta, but our baker gives us one fresh from the oven and you can't beat that! For the record, this is just gross to run in. Yesterday Diane, Jeff, and I ran - it was still sprinkling from the heavy rainstorms we'd had the day before. 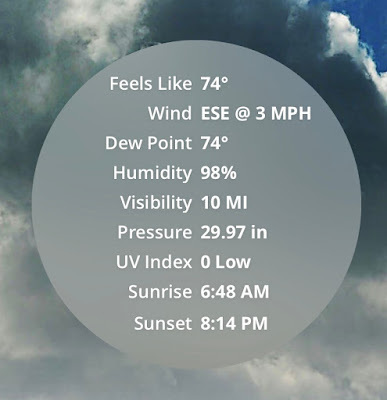 Humidity and dew point were at miserable levels; we managed to run 2.5 miles but it wasn't pretty. There is nothing happening but gutting it out when conditions are like this - our only hope is that we are somehow going to get rewarded with the BEST RUN EVER when we get our first cool front a few months from now. Cary and I worked on the running schedule for our group last week; we're trying something a little different this go-round, which is to do a 16-week training for the Houston half marathon. We reasoned that since we're all still running, we should be able to handle starting off with 5 miles and increasing from there. Well, Cary might have more of a challenge considering she'll be giving birth and recovering from that, but she feels pretty good about getting back out there. The really nice thing about a shorter training schedule is that we won't officially start until the end of September, and while it will still be hot, we won't have been running longer distances already for 8 weeks before that time. I think we end up just being worn down from running so much in the heat that it makes training for Houston feel harder than it has to be. I'm excited to still be in the off-season for a while still - we can run but not overdo it in the heat, plus I'm looking forward to powering through that shorter schedule once we begin training. For the record, that's actually walking weather. That dewpoint! OMG. I guess I didn't realize you guys trained longer than 16 weeks for your half marathon. That's plenty and I bet, as you said, you will like it better. I knew you'd appreciate that dewpoint. When I joined USAFit in 2010, they used a 24-week training program and that's what we got used to doing. But we're not beginners, we all run year-round, and we finally decided to give a shorter program a try this year. I got a taste of that when I was in Alabama, although Holly tells me it was cooler than normal when I was there. It was humid though! How scary to see the armadillo! Are they aggressive? Armadillos have very sharp teeth, will hiss at you, and are speedy runners - so yes, they can be aggressive. Plus, any wild animal in my path is suspect, even a deer. You just never know what they are going to do! I approve of your shorter training schedule :) Although when you were describing it, I was thinking, Wow, that's a long time. So there you go, a non-runner's opinion on running---totally useless. I'm better at commenting on BB :)) I wish I had seen an armadillo when I lived in Texas. But I wouldn't want to be startled by one. It's crazy to realize that 16 weeks is short, isn't it? And I can't believe you never saw an armadillo while you were living in Texas! We've had one roaming our cul-de-sac some years, digging up everyone's flower beds, grrr. You are all such experience runners by now that a shorter training schedule won't be a problem for you and it's a smart thing to do. Love it that the Blue Baker thinks of you even when you're not coming. Time will tell if the shorter schedule works for us, but it's definitely time to change things up. When I lived in Texas, I remember this time when I was petty young and I saw this creature in our driveway ( we lived in a neighborhood not in the country). It was like a mix between a huge turtle and a reptile. I often look back on that day and wonder if it could have been an armadillo. I had never seen one while living in Texas. I read the comments to see that someone answered about the armadillo - I didn't know they were threatening. Man, good for you guys for getting out in that nasty heat!!!! And yay for shorter training cycles. I'm a huge fan. My friend suggested to me to run the Houston Marathon. But ugh, that weather last year! Texas race day weather is very unpredictable, but even if it tanks, the Houston Marathon still is a great race. You totally should run it! Better decide quickly though - the marathon is almost full.